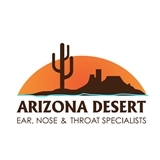 Arizona Desert ENT Specialist (Goodyear) - Book Appointment Online! Dr. Charous has been practicing in the valley for several years and is board certified by the American Board of Otolaryngology. He specializes in chronic nasal and sinus conditions. Our office has state of the art equipment which includes an in office CT which allows for a prompt diagnosis and treatment plan. Dr. Charous also treats a wide array of ear, nose and throat conditions including sleep apnea, snoring solutions, and thyroid surgery.